Club Korum starter kits reflect our ongoing mission through the I ♥ Fishing campaign, providing a fantastic option for anglers that are new to the sport. 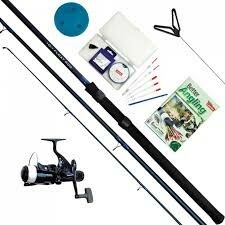 It’s ’Fishing Made Easy’, and the new Elements fishing kits help provide a first easy step for would-be anglers. Club Korum tackle will enable more anglers to get into fishing, removing some of the doubt and confusion about what tackle is best to get them started. By creating ready-to-go fishing sets, complete with all the tackle they need for an an enjoyable day’s float fishing or feeder fishing, the choice is now incredibly easy.